hunting grounds from gold miners and prospectors. "Red Cloud's War," as it became known, ended after the US Army suffered a devastating defeat in battle and agreed to Red Cloud's demands. In 1868, the two sides met at Fort Laramie and signed a treaty establishing the Great Sioux Reservation. The peace was not without problems. So in 1870, Red Cloud made the first of several trips to Washington, DC to meet with President Ulysses S. Grant. In preparation for his journey, the Lakota Sioux nation presented him with a shirt of great spiritual meaning and importance. Each element of the shirt had a special significance to the Lakota intended to impart “sacred powers” to the “Wicasa Itancan” (leader of men). It was believed the shirt would give Red Cloud the collective power of all of his people and protect him on his journey. 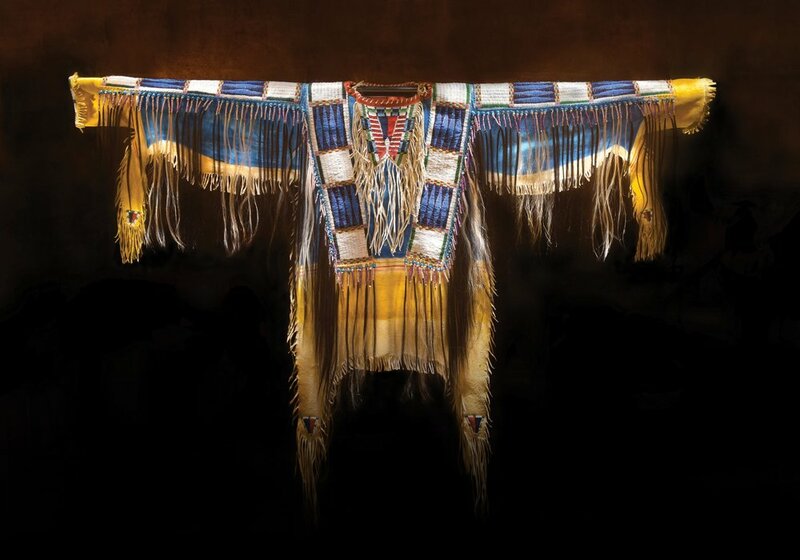 The Lakota also hoped that a shirt of such complexity and beauty would inspire awe among the white men he would meet. It served its purpose. During his time in Washington, DC and, later, in New York City, Red Cloud's stature and eloquence impressed all who met him. And since Red Cloud was the sole chief with a leadership shirt, the government photographer asked that other Native American leaders including American Horse, Little Wound, Touch-the-Clouds, Young-Man-Afraid-of-His-Horse and Woman's Dress be photographed wearing the shirt. Upon returning home, Red Cloud never led his warriors into battle again. For the rest of his life, he continued to work for his people. He died peacefully in his sleep in 1909 at the ripe old age of 88. His remains are buried at a school named after him for his love of the Lakota people to educate them in the way of peace. As for the sacred shirt, it was misplaced on Red Cloud's return trip to the reservation and finally rediscovered among unclaimed baggage in Minnesota. Too late to be returned to Red Cloud, the shirt was placed on permanent display at the Buffalo Bill Center of the West in Cody, Wyoming.